It's Dunkin'. Hold the Donuts. Dunkin' Donuts, the popular doughnut and coffee house, will unveil a store this month in Pasadena, California, that calls itself just Dunkin'. A few other Dunkin'-only stores will pop up later this year. 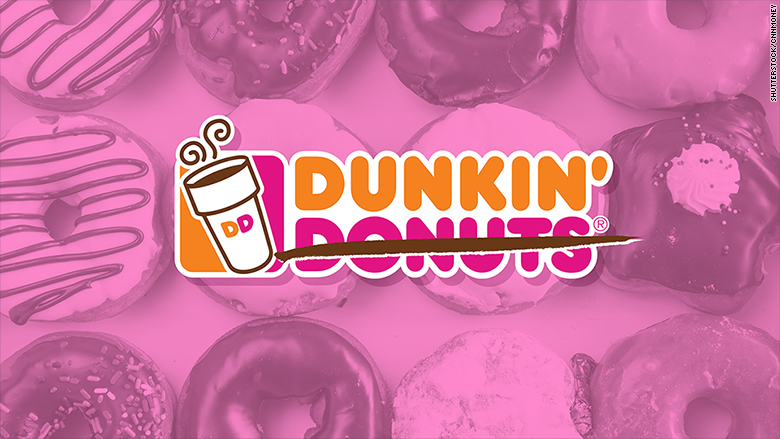 Dunkin' Donuts owner Dunkin' Brands (DNKN) said the company might make it official next year. That would mean dropping "Donuts" from its thousands of stores' signage and its ad campaigns -- but it hasn't made a decision yet. "This test coincides with our company's plans to develop a new restaurant image," Dunkin' Brands said in a statement. "We do not anticipate making decisions regarding our branding until the latter half of 2018 when we begin rolling out our new store image." That image may be less food-centric. Dunkin' said it wants to put more emphasis on beverages. That, of course, means coffee. The company says it wants to reinforce that it's a "beverage-led brand and coffee leader." Dunkin' Donuts already has the breakfast pastry market cornered. It's the undisputed industry leader of the U.S.'s $14.6 billion doughnut shop industry, with a 62.1% share, according to data from IBIS World. The company has been increasingly aggressive in the market for coffee, with some success. It's rolling out new products -- like a new version of its frozen coffee -- aimed at drawing in more caffeine lovers. So, would a slight name change that ditches the "Donuts" be all that jarring? Should Dunkin' Donuts rebrand as just "Dunkin'"? The company points out that it's used the Dunkin' moniker in advertising for years, like in its "America Runs on Dunkin'" tagline. But the Dunkin' Donuts name has branded coffee and pastry shops for nearly seven decades -- since the very first shop opened in Quincy, Massachusetts, in 1950. Today, that name appears on more than 11,300 restaurants worldwide, including more than 8,500 in the U.S.
Dunkin' Brands announced plans to open 380 to 450 more locations this year. The company's stock also hit an all-time high recently.